Do you use your pool all year long? 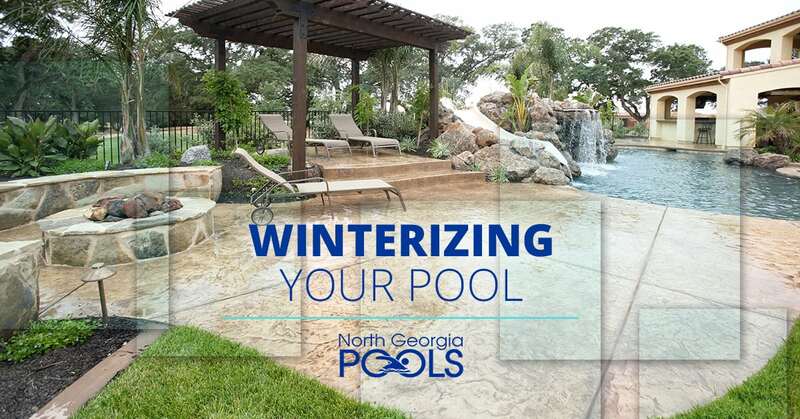 Whether you put your pool to bed for the winter or continue using it, you’ll want to give it a little extra love in the cold weather. If you spend a little time now, and over the winter months, you’ll be glad when spring comes and you don’t have to do a lot of work to get your pool ready for anxious swimmers. North Georgia Pools is here to help you maintain your pool all year long. But, if you want to do some of the work on your own, here are some important things to consider. If you aren’t planning to use your pool in the winter months, the first thing you’ll want to do before closing it up is to check the water PH levels, chlorine, water hardness levels, and alkalinity. If we installed your pool, we left you with information about specific PH levels for your particular type of pool. If you aren’t sure what they PH levels should be, give us a call. We can come out and do a test and make sure everything is looking good. You don’t want to take the chance that corrosive elements in the water, like too much calcium, will damage your pool over the winter months. Follow the instructions we left you for cleaning your pool at the end of the season. Or, just give us a call and we’ll take care of it for you. Don’t forget to clean and store pool accessories like ladders and toys somewhere that they won’t be exposed to the elements. You may need to add some extra chemicals for the winter once you’ve cleaned your pool. It really depends on the type of pool you have and how old it is. Check your paperwork for information about scale and metal control strategies. If you’ve been keeping up on this all summer, it shouldn’t be a huge task. Just clean them with fresh water like you would normally do. Then, check your manufacturer’s instructions for your filtration system. Depending on the type of filtration you use, it may need to be backwashed, valves may need to be adjusted, and other special steps may be required to make sure it is ready for winter. We do live in the south, but a cold snap where temperatures stay below freezing for even a short while, can do some expensive damage if you aren’t ready for it. Lower your pool water below the opening for your skimmer. You don’t want water to get into the system and freeze in there. And, if you’re in an area prone to freezing, you’ll want to look into some anti-freezing agents for your pool. If you are considering draining your pool for the winter, we recommend calling a professional for advice. You don’t want to go through that trouble if you don’t need to. And, it may not be the best thing for your pool. Just because you’ve closed your pool up for the winter, doesn’t mean you can just ignore it until you take the cover off. You’ll want to continue to check the water chemical levels and make sure the water remains clean. Inspect the pool once a month, or just give us a call and schedule your winter maintenance now. Whether you are a new pool owner, or your family has had a pool for years, why not let us do the hard work of maintaining your pool so all you have to do is enjoy it? You didn’t get your pool to become an expert in pool maintenance. We are experts in pool maintenance. Give us a call.